She was born Anna Mack Mitchel on June 20, 1919, in Lawrenceburg, Kentucky. Her mother, Nora Mitchel, was a cook in Lawrenceburg. Her father, Tom Clark, was a laborer from Harrodsburg. It is not certain how they met or how long they knew each other, but they were never to marry. Throughout her life Anna would use her father"s name, Clark, however, adding an "e". Also she would drop the "k" from Mack. Nora would have three more children, two boys, Franklin and Lucien, and one girl, Evelyn. When Nora died of edema, the young children were raised in the home of their grandmother, Lucy Medley, at 324 Lincoln Street in Lawrenceburg. The four children of Nora Mitchel would grow up together and become great friends. Anna Mac, as she was known to everyone, had more of the tomboy in her than the young lady. Never bashful, she told you, or let you know, what was on her mind. She was active in sports, from playing football with the boys in the neighborhood to racing on her roller skates. She was lionhearted, afraid of little. She had a soft spot in her heart for animals, especially cats, and even had a pet chameleon. Like all the other kids in the neighborhood, she would "hang out" at Mr. and Mrs. Parent"s Ice Cream Parlor and General Store on the corner of Waterfill and Lincoln Streets. She was courageous and adventurous. One day she and brother Franklin decided to go for a ride on an old mule owned by one of their neighbors. While they were riding they came upon a creek which they wanted the old mule to jump across. After getting a running starts, the mule decided he did not want to jump the creek, so he stopped dead in his tracks-which resulted in both Anna Mac and Franklin crossing the creek the hard way. crossing the creek the hard way. When Anna Mac was ten years old, she and Franklin were playing in their backyard. A storm had been brewing, and being young children, they ignored the weather and continued to play. As Franklin was pushing Anna Mac on a tricycle around an old cherry tree, a bolt of lightning came out of the sky and struck Anna Mac, knocking her off the tricycle. Other than being a little shook up, Anna Mac nor Franklin was injured. Growing up in the home of their grandmother, the children were taught the importance of high morals and values, and the importance of having a good education. Sundays would find Mrs. Lucy and the children at the Evergreen Baptist Church on College Street. After fifteen years of perfect attendance at Sunday school the children received a Gold Pin. Anna Mac enjoyed going to school and worked hard to learn all she could. Being an extremely intelligent child, she knew she wanted to "be somebody" and really do something with her life. 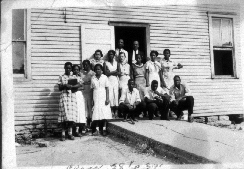 On may 28, 1937, she was awarded a diploma from Lawrenceburg High School, indicating she had completed the course of study for the Colored High School. Anna was one of three black children to graduate that year, the other two were Mabel Omega Miller and Lucy Laurie. After completing high school Anna was not going to be satisfied with her caste in life and was already setting her sights on attending Kentucky State College (later Kentucky State University) in Frankfort.